The future of the enterprise video content management market is prosperous, with the demand projected to increment at a CAGR of 10.5% during the forecast period of 2017 to 2022. Some of the key factors favoring the enterprise video content management market are: growing adoption of cloud-based content management across industries of various verticals, ubiquity of smart devices, and rising demand from the healthcare sector, wherein these tools can help in reducing the cost of care as well as can do it in real-time, which is often of great essence. On the other hand, information security continues to be the most glaring challenge for the vendors operating in the global enterprise video content management market, although SaaS and hybrid solutions are trying their best to overcome this restraint. 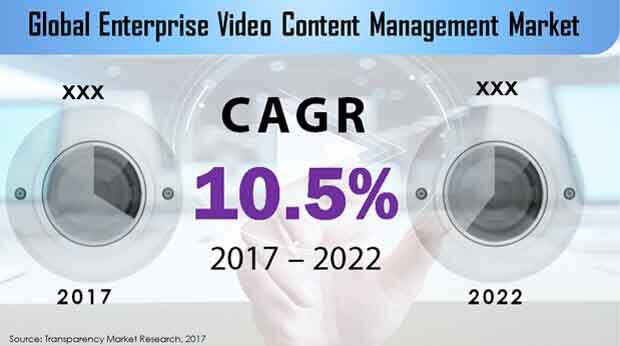 Taking all dynamics into consideration, the global enterprise video content management market is estimated to be worth US$13,309.0 mn by the end of the forecast period, 2022, which is significantly more than its evaluated valuation of US$8,070.0 mn in 2017. On the basis of component type, the global enterprise video content management market has been segmented into software platform and support service. The former is currently most profitable, offering a revenue of US$5,811.3 mn in 2017, which reflected 72% of the overall demand for enterprise video content management. Going forward, the software platform segment is estimated to be worth US$9,286.6 mn by 2022 and account for 69.8% of the total demand. The demand for this particular segment is expanding at a CAGR of 9.8% during the forecast period of 2017 to 2022, and its absolute growth is large than any other segment. Based on industry, the global enterprise video content management market has been bifurcated into media and entertainment, healthcare, retail and consumer goods, banking, financial services, and insurance (BFSI), government, IT and telecommunication, and others. Application-wise, the market has been categorized into training and development, corporate communication, and others. Currently, corporate communication is posing more demand than other application categories, with video messaging gaining strong popularity among various enterprises as it offers personal feel than the text in an email. Workers at different geographical locations can now use webcast to attend events and seminars and gain training, which not only saves time but also is cost effective. Region-wise, this report represents the potential of enterprise video content management market in the regions of North America, Europe, Asia Pacific except Japan (APEJ), Latin America, and the Middle East and Africa (MEA), and it also contains a dedicated chapter on the country of Japan. Among these, North America enterprise video content management market is currently most profitable, serving a demand worth of US$US$2,720.8 mn in 2017 and expanding at a CAGR of 9.6% from now until 2022. The developed countries of the U.S. and Canada have wide adoption of video communication among the blue chip companies, and this factor will push the demand from North American region up to a valuation of US$4,293.6 mn by 2022. Revenue from Europe enterprise video content management market is anticipated to increase at a CAGR of 11.3% over 2017-2022, to reach US$ 4,174.2 Mn by 2022. On the other hand, Asia Pacific except Japan has a rapidly growing communication services industry, particularly in developing countries such as China and India. This factor will pose a demand for enterprise video content management from the region of APEJ worth of US$967.5 mn between 2017 and 2022. Microsoft Corp., IBM Corporation, Adobe Systems, Inc., MediaPlatform Inc., Kaltura Inc., Qumu, Inc., Panopto Inc., Brightcove, Inc., Sonic Foundry, Inc., and VBrick Systems Inc. are some of the key companies currently operating in the global enterprise video content management market. This report on the enterprise video content management market analyzes the current and future scenario of the global market, and aspires to serve as a reliable business tool for targeted audiences such as enterprise video solution and platform vendors, IT developers, consulting service providers, cloud service providers, government agencies, network and system integrators, content delivery network providers, webcasting and video conference service providers, and video on-demand service providers. The enterprise video content management market report comprises an elaborate executive summary, which includes a market snapshot that provides information about various segments of the market. It also provides information and data analysis of the global market with respect to the segments based on component type, industry, application, and geography. A detailed qualitative analysis of drivers and restraints of the market and opportunities has been provided in the market overview section. The report also provides market attractiveness analysis, by geography and market share analysis by key players, thus presenting a thorough analysis of the overall competitive scenario in the enterprise video content management market. Besides a thorugh primary research which formed the bulk of this report, in-depth secondary research was done to compute the market size. The report comprises the forecast of the global revenue generated by sales of hardware and software required for enterprise video content management. TMR triangulates the data via different analysis based on supply side, demand side, as well as dynamics of the market. TMR not only conducts forecasts in terms of value, but also evaluates the market on the basis of essential parameters, such as Year-on-Year (Y-o-Y) growth. This helps providers to recognize the future opportunities as well predictability of the market. Absolute dollar opportunity is critical in assessing the level of opportunity that a provider can look to achieve as well as to provide potential resources from sales perspective of the global enterprise video content management market. On the basis of component type, the global enterprise video content management market has been segmented into software platform and support service. Based on industry, the global enterprise video content management market has been bifurcated into media and entertainment, healthcare, retail and consumer goods, banking, financial services, and insurance (BFSI), government, IT and telecommunication, and others. Application-wise, the market has been categorized into training and development, corporate communication, and others. Geographically, the report takes stock of the potential of enterprise video content management market in the regions of North America, Europe, Latin America, The Middle East and Africa (MEA), and Asia Pacific except Japan (APEJ). Some of the key countries among these regions identified by the report that have considerable market for datacenter deployment spending are: the U.S., Canada, Brazil, Mexico, Germany, the U.K., France, Spain, India, China, Malaysia, Thailand, GCC countries, South Africa, and Israel, and Nigeria. For each of these countries, the report provides revenue comparison based on component type, industry, and application.